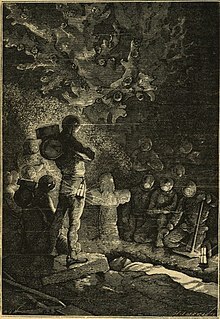 Buirial or interment is the ritual act o placin a dead person or ainimal, whiles wi objects, intae the grund. This is accomplished bi excavatin a pit or trench, placin the deceased an objects in it, an coverin it ower. Burial is eften seen as indicatin respect for the dead. It haes been uised tae prevent the odour o decay, tae gie faimily members closur an prevent them frae witnessin the decomposeetion o thair loved anes, an in mony culturs it haes been seen as a necessary step for the deceased tae enter the efterlife or tae gie back tae the cycle o life. This page wis last eeditit on 28 September 2016, at 18:12.